The Tsukuba Naval Air Group Museum opened in December 2013 and reached 110,000 visitors by April 2015. The origins of Tsukuba Naval Air Group go back to 1934, when the Tomobe Detachment of the Kasumigaura Naval Air Group was established. In December 1938, Tsukuba became an independent air group as part of the 11th Training Combined Air Group. 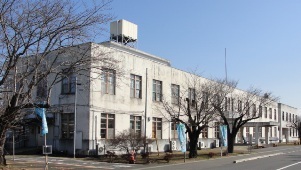 The museum building is the Air Group's original headquarters, although it was used for many years after the end of World War II by Tomobe Hospital. The museum stands on the grounds of the Ibaraki Prefectural Medical Center of Psychiatry, which has a large building near the museum. 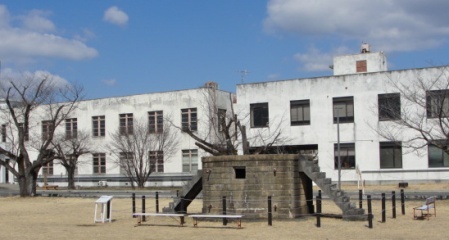 The medical center grounds also have some remains from the war such as a drill platform made of stone, the gates to the base, and the foundation of Tsukuba Jinja (Shrine). In addition, five members of the original 7th and 8th Tsukuba Squadrons became members of the 1st Jinrai Bakusen Squadron in the Kamikaze Special Attack Corps. On June 22, 1945, they took off from Kanoya Air Base and died in battle. There were also twelve airmen from Tsukuba Air Group who became members of the Kongō Unit of the Kamikaze Corps and died in special attacks in the Philippines between December 1944 and January 1945. On April 3, 1945, another pilot from Tsukuba Air Group died in a special attack from Taiwan as a member of the Taigi Unit. In total, 73 men died between December 1944 and June 1945 as members of the Kamikaze Special Attack Corps . The Tsukuba Naval Air Group Museum is open every day from 9 to 5 with an admission fee of 500 yen. All of the exhibits are in Japanese with no English translations. Visitors get a free 24-page booklet in Japanese with many historical photographs, a map of sites related to the former air base, and a historical chronology of Tsukuba Air Group. There is a store where books and other souvenirs can be purchased. Tomobe Station is the closest train station to the museum, which can be reached by walking about 30 minutes or by bus or taxi. 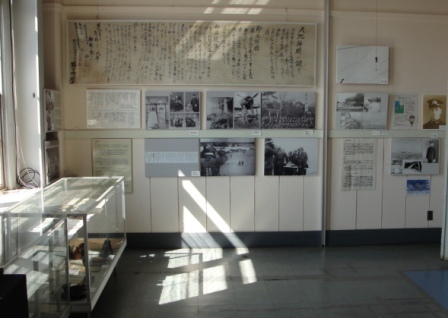 The museum contains many exhibits, such as photographs, letters, and stories, about the men who died as kamikaze pilots. These include Shinichi Ishimaru, a former professional baseball player whose life story was made into the 1995 movie Ningen no Tsubasa (Wings of a Man), and Shunsuke Tomiyasu, whose Zero fighter hit the aircraft carrier Enterprise (CV-6) on May 14, 1945. That attack killed 13 and wounded 68. There are several exhibition rooms open to the public on the museum's two floors. 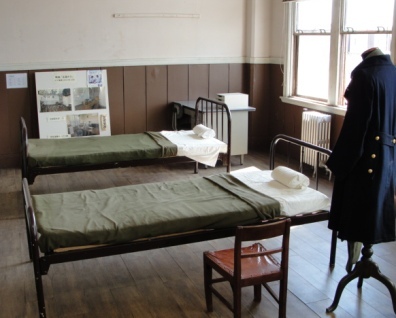 These include a couple of rooms on the second floor used in the filming of the 2013 movie Eien no 0 (The Eternal Zero). Another exhibition room on the second floor has many ship models on display. The Tsukuba Naval Air Group Monument can be reached by a short walk from the museum. The museum itself does not maintain a web site, but Project Ibaraki has a web site about the Tsukuba Naval Air Group in conjunction with the movie Eien no 0 (The Eternal Zero).